When they opened Magny-Cours in 1960 it was called the Circuit Jean Behra, named after France's best racer of the 1950s who had been killed the previous year at the AVUS. It was one of those lovely racing tracks which someone with a lot of money had built because they had a lot of money. That original track was only just over a mile in length although success in the early years resulted in the length being doubled in 1971, a few months before the track's founder Jean Bernigaud died and the track was handed on to the local motor club - the ASA Nivernais. It remained an unimportant sort of place until the middle of the 1980s when the local authorities bought it and piled in so much money that people thought that something odd was going on and after lots of political moves the French Grand Prix left its home in Paul Ricard and headed to Nevers where there were none of the delights that made the F1 world like Paul Ricard so much. 10 years later the race is still here and will go on now until 2004 by which time, perhaps, Paul Ricard will have been rebuilt and we can go back to the beaches. Magny-Cours is the quietest race of the year because no-one really wants to go there due to the fact that there are not enough hotels and people have to drive for hours to get to the area. Furthermore, because the roads near the circuit are not much better than those at Silverstone, there is then the prospect of queuing to get in. The helicopters are used heavily, of course, but that is only for the beautiful people so the normal folk come to Magny-Cours in camper vans and tents and stay at the track, drinking, barbecuing and having a nice time at the start of the European holiday season. There is not much to do once you have walked around the circuit, visited the go kart tracks and had a quick look around the Ligier museum and so everyone gets together and has a good time and it seems that most folk enjoy themselves. But in the paddock it is not a favorite. It is quiet. The race track is one which has grown in stature over the years because it is one of the very few places left where there is a corner where one really can overtake. The Adelaide Hairpin was copied from the track of that name and it works, which means that qualifying is not as important as it is at tracks where overtaking has become impossible. But being on pole is still an advantage of eight meters and that is important in Formula 1 today. For most of practice it looked as though David Coulthard was going to be on pole position and he probably should have been, but the qualifying session was a disaster for the McLaren team as David went through a string of technical problems. "I feel particularly for the poor mechanics because they have had to work under pressure while at the same time checking things while rebuilding the car," said David. "Every time they have changed one part it has run fine... until the next part has broken." It is not the ideal preparation for qualifying. First there was a cracked oil tank and then an air valve glitch. David could not remember what the next one was. He was in the spare and then back in his own car. He had a spin and then he had Ralf Schumacher pull out in front of him. The result of all this was that David missed pole position by a tenth and allowed Michael Schumacher to put his Ferrari ahead. Michael did not seem to be as buoyant as usual and one got the impression that he realized that if all had gone well for McLaren he would not have been on pole. "We don't know how things would have been if David had started in his race car," said Michael, making it very clear that he had a very good idea of what would have happened. Still, you do not look a gift horse in the mouth. A pole position is a pole position and Michael Schumacher is not too proud to accept a gift from a rival team. Third on the grid went to Rubens Barrichello who reckoned he would have done better if he had not taken a risk and changed his set-up early in the session. It did not work and by the time things had been changed back the track was hotter and so he did not achieve the maximum possible. Mika Hakkinen was fourth fastest and everyone was mystified. This was not the Mika Hakkinen we know and everyone is confused as to what is going on in the mind of the Finn at the moment. Given that Coulthard had gone through a number of flaming hoops to achieve his time, Hakkinen's effort was really not that good. Those around him say that Mika Hakkinen has no problems and all is well and that he is just having a little trouble with technical stuff but it is hard to believe. The members of the McLaren team don't want to say anything and so they merely shrug. You would have to be a blind man not to have noticed that all is not well and Mika is a shadow of his former self in the racing car. Fifth fastest was a good performance from Williams' Ralf Schumacher although the German admitted that he was a little surprised about how well things had gone. He grabbed the place from Eddie Irvine in the final moments of the session. Jenson Button continued to show well, although such are the elevated expectations these days that some people seemed to think this was not much good. Seven-tenths slower than Schumacher was a bit of a gap but Jenson is still learning at each and every track. The team was happy with 10th on the grid. Irvine's result was a good performance given the disappointing showing of the Jaguar team in recent events. Irvine was back where he was at the start of the year, sixth or seventh on the grid. It was better than in recent races but one has to ask whether things should be better than that. Johnny Herbert was 11th on the grid, eight-tenths slower than Irvine and disappointed. "I think today's performance is a more accurate reflection of where we stand in the overall order," said Jaguar technical director Gary Anderson. "We came here with a much more deliberate strategy for the weekend and, so far, it has paid dividends." Jacques Villeneuve was seventh on the grid which was a good effort in the troublesome BAR-Honda. The result was largely down to Jacques's skill and commitment rather than the new aerodynamic package on the car (although it probably helped a bit). Villeneuve delivered the goods. This will be a useful talent next year when he drives elsewhere. Ricardo Zonta was 19th on the grid. He was not helped by a major engine blow-up early in the session. The spare car did not have the same parts fitted as the race cars and so was not as quick. The two Jordans were a disappointment with Heinz-Harald Frentzen eighth and Jarno Trulli ninth. A few tenths would have bounced them up to fifth. Frentzen reckoned that the team did not get everything together and Trulli admitted that he had made a mistake which cost him a lot. Things were looking a little better for Sauber with Mika Salo 12th on the grid and Pedro Diniz 15th. The team had a new version of the Ferrari-based engine. Diniz had to go to the spare when his own car developed gearbox trouble but, because it was set up for Salo, it was not perfect. Pedro de la Rosa was 13th in his Arrows which was about what one would expect from the car, despite the fact that he had switched into the spare after his own developed electrical trouble. Jos Verstappen was a very disappointing 20th, complaining that the car was not handling well. "It just all felt wrong," he said. Benetton was disappointing with 14th and 17th places on the grid for Giancarlo Fisichella and Alexander Wurz. The Benetton chassis continues to be good at some tracks and terrible at others. This is the second team of designers to have worked for Benetton in recent years and so one must conclude that the problem is more fundamental. Perhaps the windtunnel is misleading them. Whatever the case, it is odd. The performance of Prost with the much-heralded new Peugeot evolution engine is barely worthy of comment. Nick Heidfeld was 16th on the grid and Jean Alesi 18th. When there is a car that Jean Alesi cannot drive fast there must be a problem. Jean said that he had handling and engine problems. For Alain Prost it was the latest in a series of hard blows particularly as the team had shown rather well in pre-race testing at Magny-Cours. The Minardis were at the back and there is nothing new in that. ON Sunday morning Mika Hakkinen was fastest in the warm-up and everyone was confused once again. Had Mika shrugged off his current lethargy? It was hot and humid on race morning when French Prime Minister Lionel Jospin flew in to be part of the F1 show. He is a socialist and so a visit to the socialist monument of Magny-Cours was acceptable behavior. There were gaggles of government ministers wandering about as the morning wore on and the temperature rose. It was going to be a day when engines would suffer. There was, so they said, a 40% chance of rain in the middle of the afternoon and after a massive downpour on Saturday afternoon everyone was aware that it could turn into a wet and dry event. But the weather was nice enough at the start. Michael Schumacher was slightly slower off the line that one would anticipate and Coulthard began to creep up on him. As is now the established behavior, the man ahead moves across and blocks his rival. Michael did it. David was forced to lift off the power, to avoid hitting the Ferrari, and switched to the right to try to pass Michael on the other side. As he came across the road, so Barrichello appeared on the very piece of tarmac that David was planning to use. He had to lift again. "I didn't try to run Rubens off the circuit," David said. "I gave him the room that I thought he deserved to have. We battled it through the corner and he won it. That's how it should be, it should be done in a sporting way, not in a 'You lift, otherwise you will crash' sort of way." So there were two Ferraris ahead with Coulthard third and Hakkinen fourth. We expected to see Michael disappear off into the distance with Barrichello holding up the two McLarens but the rate of progress was not as dramatic as one would have expected. The race was not over by any means. Coulthard could do nothing about Barrichello early on but, as the fuel load began to go down, David found the car handling better and so began to pressure Rubens. Even so it took until lap 22 before he passed Rubens for second place with a lovely manoeuvre at the Adelaide hairpin. He went in wide and so came out faster and as Rubens did the gentlemanly thing and did not swerve into him David was able to pull alongside and take the place at the fast right-hand kink which follows. It was just how motor racing should be. Clean but hard. In the laps which followed Coulthard closed in on Schumacher and it was very clear that there was nothing that Michael could do to react to David's charge. "The tires on the car seemed to suffer a drop in performance earlier than the others," Michael explained. "It was worst after the first pit stop. At first I could control the situation but then the tires went off and I tried to look after them, knowing that there were still a lot of laps to go." It took until lap 34 before David was close enough to have a try at passing the Ferrari to take the lead. David concluded that the best way to challenge was around the outside which, when you are dealing with Michael Schumacher, is perhaps not such a good idea. Michael has slightly different views than others on what is permissible and what is not. David was alongside the Ferrari as they went into the corner and Michael let his car drift out as we knew he would. Coulthard had to lift off to avoid an accident. He was not amused and made a series of irate gestures. A few laps later David dived for the inside at the same corner. This time Schumacher could do nothing. David made it very clear that he was not going to lift off and he was ahead as they exited the corner. Michael was refusing to lift off and eventually, as the road ran out, Michael's right front wheel came into contact with the front of David's left rear. Here we had the makings of a dreaded wheel-over-wheel accident: when two spinning tires hit one another the result is totally unpredictable. Either car could be launched skywards into a series of somersaults. Both could spin. On this occasion the impact merely skipped the McLaren slightly across the road. It may not have looked much on the television but in that moment David Coulthard sent Michael Schumacher a very clear message. He is ready to stand up to Michael and he is not afraid of what will happen if Michael does not lift. If Michael is going to do it to others he must be willing to accept that someone is willing to do it to him. More often than not the others back down. A few years ago at Monaco Alexander Wurz stood up to Schumacher is a similar way and had a huge accident a few laps later when his suspension failed as a result of the contact between the two cars. Wurz has never been the same driver since that day. "I have to apologize for my hand gestures," said Coulthard later. "My emotions were running high. I knew that I needed to win in order to be in a position to battle for the championship. That is what I am trying to get done and I felt that I had a clean run on Michael on the outside. I felt that he drove me wide. Now you might say that he had a right to do that because he had the track position but it made me very angry. I just don't think that Michael is sporting in the way he drives on the track. I know there will be those who say that there is an element of sour grapes and that is the way a driver has to win these days. But there are set rules about the way you drive on the track, and to try to drive an opponent off the road is not within those rules. A driver must be able to trust the people against whom he is racing because he is risking his life. I want to win badly, and it will come to the point where the only option for someone to learn will be not to lift. Then there will be a collision and what happens after that will be in the hands of the gods." David's overtaking manoeuvre had shown that he is willing to trust his fate to the gods. He was in a plane crash a few weeks ago and it has affected his view of the world. There may not have been many who appreciated the message but Michael Schumacher knows that the next time he goes wheel to wheel with David there will be no prisoners. Coulthard is not going to back off and so if he keeps his foot down he is going to be risking it all: wife, family, money and all the rest of it. We shall have to see how he reacts to that but the message has been sent. Michael will have flown home on Sunday night with a new respect for Coulthard. Once he was ahead Coulthard was gone and he duly won as he pleased. It was a splendid victory and after Schumacher went out with an engine failure it became the perfect result: a McLaren 1-2 with Schumacher failing to score. Hakkinen was happy to be second which is a curious concept to grasp but he really did seem to be content. Perhaps he is happy that he is no longer the one under the pressure of being the World Championship challenger. Who knows? Hakkinen moved to third when Barrichello had a less than swift pit stop on lap 25. Later Rubens would have a disastrous stop which cost him an extra 10 seconds when a front right wheel nut stuck on the car. He was able to close up because the fading Schumacher was holding up Hakkinen but once Michael was gone Rubens was no threat. He finished third. Fourth place was fought over in the closing laps by Jacques Villeneuve and Ralf Schumacher. Ralf had made a bad start while Jacques had blasted himself forwards as he so often has in recent months. He went from seventh on the grid to fifth. He was not under any serious threat from sixth-placed Heinz-Harald Frentzen and was unable to keep up with the cars ahead and so he had a lonely time until the closing stages when Ralf Schumacher caught him and tried everything to get ahead. "He was better in the corners," said Jacques, "but I was quicker on the straights." In the end Ralf backed off a little to guarantee two points to Williams. He might have challenged but after their recent crash in Canada, Jacques must seem rather an unpredictable adversary for Ralf and so he decided not to risk too much and settled to get the points. Villeneuve's BAR team mate Ricardo Zonta went off early with a brake problem and bumped into a tire barrier. Ralf's team mate at Williams, Jenson Button, did a very good job after a poor start which dropped him behind a fast-starting Salo. He overtook Irvine's Jaguar on lap 12 and Salo on lap 13 and then he chased after the two Jordans and Ralf Schumacher. The order was scrambled at the first stops and Button found himself behind Frentzen and Ralf. He looked to be stronger than both of them but he could not overtake and so he pitted early (a mistake) and while Ralf got ahead of Frentzen at his stop, Jenson was stuck behind Heinz-Harald all the way to the flag. "It was a bit annoying," Jenson admitted later. Trulli's fast work at the pit stops netted him sixth place while Frentzen was seventh and Button eighth. Behind the Williams was Fisichella's Benetton. This was not a bad result for the Italian given that he had qualified 14th and then made a bad start to drop to 16th. A sensible strategy and some hard driving dragged him back up into the top 10. Wurz's race was another disaster. He dropped from 17th on the grid to 20th at the end of the first lap. In the mid-race he was running 16th when he locked up his brakes and went off at the final corner. Salo and Diniz finished 10th and 11th in their Saubers after a hard race. They were fighting their cars all the way. Twelfth place went to Heidfeld and with Alesi 14th Prost Grand Prix could at least claim to have finished with two cars. There was nothing else to claim. It had been a horrible weekend, the crowning moment being in the race when Heidfeld tried to outbrake Fisichella and overshot, tipping Alesi into a spin. A chapter best closed. The same was true of Jaguar Racing. Herbert went out with (another) gearbox failure while Irvine dropped from sixth on the grid to 10th at the end of the first lap. This was hardly a good start and from there it was backwards all the way as he fell behind Button. During the pit stop he had trouble with the front left wheel nut and by the time that had been fixed he was as last as last can be. He hurried along making up time but it was always a hopeless task although he did set the third fastest lap of the race. 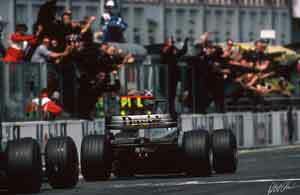 For Minardi, Marc Gene was 15th and spent most of the afternoon battling with Alesi. They collided and spun at one point but ended the afternoon half a second apart. Mazzacane spun off in the middle of the race. The only team not to get a car home was Arrows. The two cars went out with gearbox failures in the mid race.